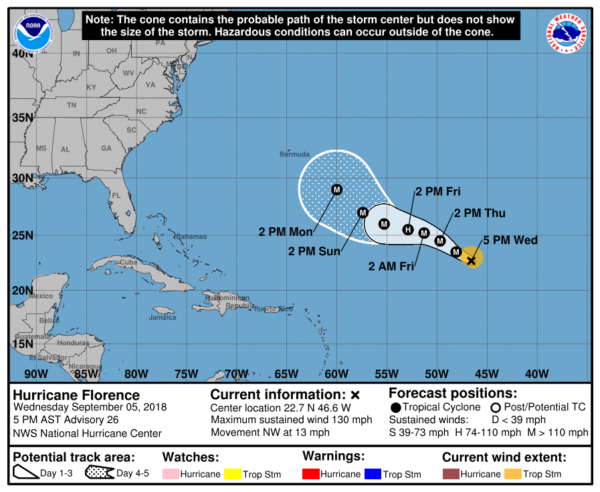 Florence, which became the first significant hurricane (Category +3) of the 2018 Atlantic season, had maximum sustained winds of 130 mph, according to the National Hurricane Center (NHC). The powerful Category 4 storm is some 2,000 miles from the US coastline, but it is moving northwest at 13mph, will generate big swells in Bermuda starting Friday and could slam into the US East Coast next week. Florence became a hurricane on Tuesday and immediately strengthened to a Category 4 hurricane on Wednesday afternoon. 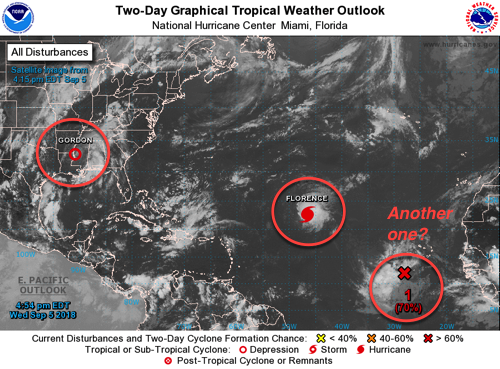 “Florence defied all odds developing over not-so-hot water, dust on all sides, and strong upper shear. 5pm has her at a Cat 4 130mph. This is from the NHC: “It should be noted that there is considerable model ensemble spread and run-to-run variability for Florence’s track beyond day 5. Given the large uncertainty at these time ranges, it is far too soon to speculate what, if any, impacts Florence may have on the U.S. East Coast next week. Regardless of Florence’s eventual track, large swells emanating from the hurricane will reach Bermuda beginning on Friday, resulting in life-threatening surf and rip currents on the island. Swells from Florence could also reach the U.S. East Coast by early next week,” said Mike’s Weather Page. The latest computer models show the menacing hurricane coming dangerously close to the East Coast next week. While it is too early to forecast the exact path, some models show a recurve out to sea. By the end of this week, meteorologists will have a better grasp on the storm’s bearings. “Very concerning shift in the EPS ensemble guidance with Hurricane Florence … must now seriously consider this storm a U.S. landfall threat. Still considerable uncertainty about a possible / hopeful turn away from the coast out to sea. Continue to monitor thru the weekend,” tweeted Ryan Maue, Meteorologist @weatherdotus. “Latest idea from the European ensemble tell us a lot: we have much more to figure out before solving the track mystery that is Florence,” tweeted Ed Vallee, Meteorologist @Valleewx. “Group of simulations from European (red) and American (blue) models indicate there is some chance Hurricane Florence is a problem for the East Coast in 7 or 8 days. It could turn out to sea, too. For now, we just watch,” tweeted Capital Weather Gang. While there is much uncertainty surrounding its trajectory — the models’ overwhelming show the East Coast could be in Florence’s crosshairs in the next 8 to 10 days. 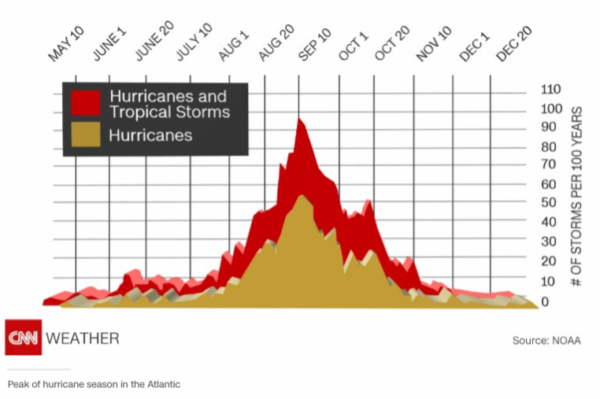 Even if Florence curves out to sea, models show numerous other systems developing right behind it, which indicates that hurricane season is nearing its peak. From now until early November, this is the timeframe for the conditions that fuel powerful storms. The focus on Florence comes less than 24-hours after Tropical Storm Gordon made landfall late Tuesday near the Alabama-Mississippi border, leaving one person dead and ushering wicked weather across the western South and the Midwest.